I need to determine which firmware update to download. 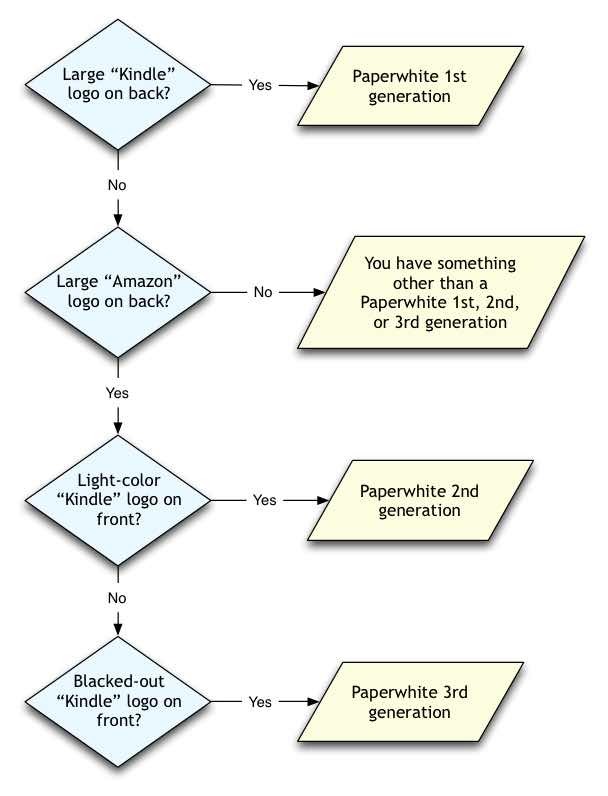 The Amazon site is helpful if you know exactly which generation or model of Kindle you have. But they give no guidance as to how to determine which generation or model I own. Is there some way on the hardware or within the software to determine which generation of Kindle Paperwhite I have? The first Paperwhite has big “Kindle” logo on back, versus “Amazon” for the 2nd and 3rd Paperwhites. The 2nd generation of Paperwhite has a light “Kindle” logo on front versus the 3rd generation that has a blacked-out “Kindle” logo on the front. I distilled the information from the articles linked above into this flowchart. Not the answer you're looking for? Browse other questions tagged kindle kindle-paperwhite or ask your own question. How does the kindle define how many “book size dots” to display? Which distributor do authors prefer I purchase from? which kindle supports remote factory reset?